The shelf not only fits into the dado but also consists of a pair of through mortises. Through mortises are a great challenge and enhance the appearance of a piece along with making a great joint. After milling the shelf pieces I carefully measured and cut out the two pins. Upon completion of both ends it was immediately apparent that my great looking pins were not correct so I milled another piece and started again. I missed the subtle step so decided that more practice was in order. The photo above shows both pieces, the bottom one being correct. Next is the creation of the mortises for the tenons. 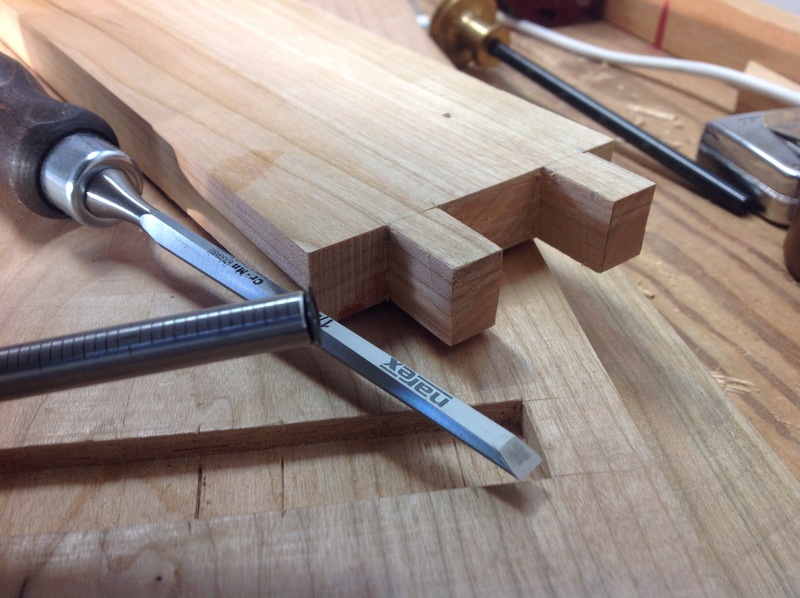 Making a through mortise is all about careful measurement followed by patient chiseling. Through mortises are definitely tough. Nice work. I’ll be making a similar cabinet when I finish the shop. I look forward to seeing more of your progress. Thanks for stopping by challenging and fun.